As mentioned above, the month’s Charcutepalooza challenge is brining, which is a way to use seasoned, salted water to infuse extra moisture and flavor into meat or fish. For years, we have used a brine with our grilled shrimp, pork, even lobster tails. The brine keeps the protein from drying out, despite the heat of the grill. We are also huge fans of Alton Brown’s honey brine, which has resulted in some fantastic Thanksgiving turkeys over the last few years. It takes A LOT of spices to make corned beef. As with most of the challenges so far, we used the book Charcuterie as the guidepost for our corned beef. The recipe calls for brining with “pickling spice,” which uses 10 different spices/seasonings. The recipe makes more pickling spice than you need for the size of corned beef that we made, even with using the spice twice during the process of making the corned beef. If you happen to misplace your extra pickling spice somewhere in your pantry, you can always make another batch (which means you will find the misplaced spice batch immediately thereafter.) Not that we did anything so foolish, but if you happen to need some pickling spice, give us a call. Assembled ingredients for corned beef — pink curing salt (which gives the corned beef its signature pinkish hue), Kosher salt, pickling spice (the first batch), sugar and beef brisket. Start by simmering water in a large stock pot, with the pink salt, Kosher salt, pickling spice and sugar. Heating the water ensures that the salt and sugar dissolve completely. Because you don’t want to add raw meat to a hot brine (or else the meat will start to cook), cool the brine with ice or a rest in the fridge until the temperature is below 40 degrees. When the brine has cooled, add the brisket. We put a plate on top of the brisket to keep it submerged in the brine. Place the beef in the stock pot in the refrigerator for 5-7 days. After a week, the beef pretty much looked the same in the brine. Once we took the beef out of the brine and rinsed it under cold water, it seemed to be a dull gray color — far from the pinkish hue we were expecting. The final step in the process of making corned beef is to simmer the brined brisket in a fresh pot of water seasoned with about 2 tablespoons of the pickling spice saved from the previous batch (or re-mixed, depending on whether or not you outsmarted yourself by “storing” your first batch somewhere in the pantry.) Don’t use the brine water, since it is contaminated with raw meat. Bring the water to a boil, then simmer over low heat for about 3 hours. SUCCESS! The finished corned beef was fork-tender, beautifully pink and tasted amazing. Seriously, this was the best tasting corned beef I have ever had, hands down. Even better than my favorite Proper Deli in Pittsburgh. 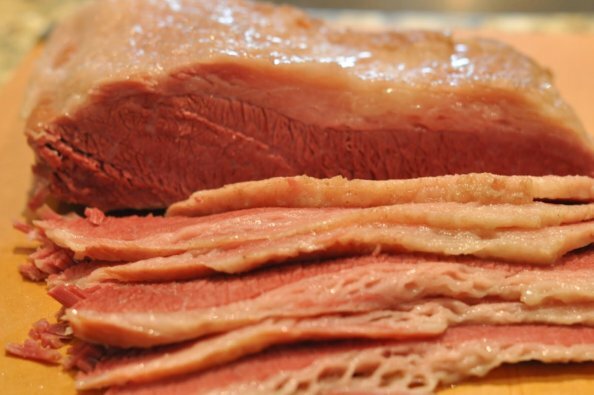 Sure, the Reuben sandwich is not the most creative use of corned beef, but there is a reason why this particular meat inspired its very own sandwich. I planned ahead and baked a loaf of sourdough rye bread, adapted from Ruhlman’s recipe. Add the corned beef, some sauerkruat, swiss cheese and thousand island dressing, and you have one of my all-time favorite sandwiches. This particular version was so good, I wanted to punch every other sandwich in the face. I garnished this perfection with a slice of homemade pickle, also brined in the pickling spice. Symmetry! In addition to sandwiches, we wanted to try to come up with other uses for the corned beef. Kelly is not a fan of cooked cabbage (there are few foods she dislikes more), so the traditional Irish / St. Patrick’s Day fare featuring our corned beef was not really an option (unless I wanted to eat it by myself). Instead, I thought the corned beef might be a welcome addition to our Potato Leek Soup. And I was right! We cut the beef into cubes and added it to the soup when we added the potatoes, then garnished with a little grated cheddar cheese. The result was delicious. The leeks in the soup paired well with the sharpness of the corned beef, and the potatoes added a creamy texture/taste. Another month, another Charcutepalooza challenge down. The genius of this collective blogging effort is that it challenges cooks to try new, perhaps intimidating recipes, but in a we’re-all-in-it-together environment that makes it all seem so much more do-able, fun and satisfying. We’re ready for the April challenge! Share your lack of stories about corned beef — grew up in German community in northwestern Ohio but trying to make up for it now! Your detailed photographs are terrific. Great post – and I love the potatoe soup idea. I have to try that. But, like you, I thought the sandwich was the way to go with this month’s charcutepalooza bounty! Thanks Lynn! The soup is one of our favorites (with or without the corned beef in it.) Your turkey pastrami looked so good! The thing that makes the meat red is potassium nitrate, or saltpeter. Back where I come from, (Maine) we don’t use any heat. We mix a pound of sugar, a pound of salt, and pickling spice in a crock with a couple of teaspoons of saltpeter, then immerse the brisket in the mixture using a weighted dish on top to hold the meat under the brine. After about a week, it is ready to go. If it gets a little mold on top of the brine, use more saltpeter next time, but the mold won’t harm the meat, as it only floats on top of the liquid. I do mine on my covered patio during cool weather, and it comes out fine. Thanks Ralph — great tip about the mold. We haven’t encountered that yet, but now I’ll feel a lot better about it if we ever do! Aw, thanks Lori — you are the sweetest! You guys are the bomb! I am drooling just looking at that sandwich. WOW love the idea of putting corned beef in potato soup. YUM! LOVE LOVE LOVE. 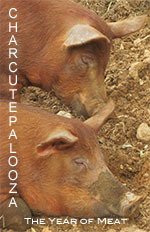 Thanks for joining Charcutepalooza. Charcutepalooza. Today we announce the ten semifinalists for the grand prize. What a year it’s been.